The Hoggs Of Fife LS151S-SD Dealer Boots are a lightweight safety boot that are 20% lighter than comparable mid weight safety boots. 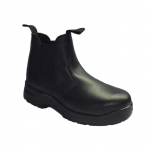 They are CE EN 345-1 SB tested giving you 200 joules of toe protection, and have deep elasticated gussets and pull on tabs at both front and rear of collar for ease of fitting. Like this Hoggs Black Safety Dealer Boot? Then why not click here to check out our wider range of men’s clothing and footwear.